Structural Assessment and Rehabilitation programme conducts in-situ quality assessment, durability investigation and residual life assessment of concrete structures such as buildings, bridges, dams, power plants, chimney, silo etc. 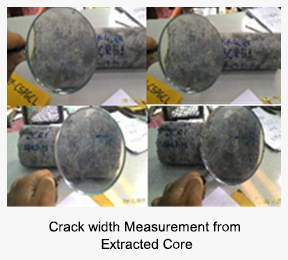 The investigations are carried out using visual observation, nondestructive evaluation technique (NDE) and other field test followed by laboratory test on extracted core samples and chemical analysis of hardened concrete. The investigation are generally followed by recommendations for repair and rehabilitation with state-of-the-art repair materials and implementation techniques for distressed RC structures covering specifications, cost estimates and bill of quantities. Bridge diagnostic testing using state-of-the-art equipment. In-situ testing of concrete structures for assessment of quality and distress evaluation of concrete structures of various types across the country (more than 35 projects per annum). Condition assessment of civil structures including field and laboratory studies using state-of-the-art equipments covering recommendations for repair and remedial for restoration and rehabilitation of the aging structures to ensure the structural integrity, restoration of strength and health of RCC structures like Turbine Generator Foundation, Boiler Mill Foundation, FD & ID Foundations, Chimney Shell, Silos etc. Study on field and laboratory investigations of concrete dam. Study for installation of suitable Monitoring/Inspection equipment inside lined water tunnels to monitor long term performance of lining without dewatering for upcoming hydro power projects. Assessment study of 32 years old Cast in-situ RCC conduit (2800mm internal diameter) carrying discharge of 200 Cusec of Ganga Water from Muradnagar to Gokulpuri, Delhi (Total 26 Km Stretch) and recommendation for restoration & strengthening for Delhi Water Supply Maintenance Unit. Assessment of fire damaged Reinforced Concrete Structures.